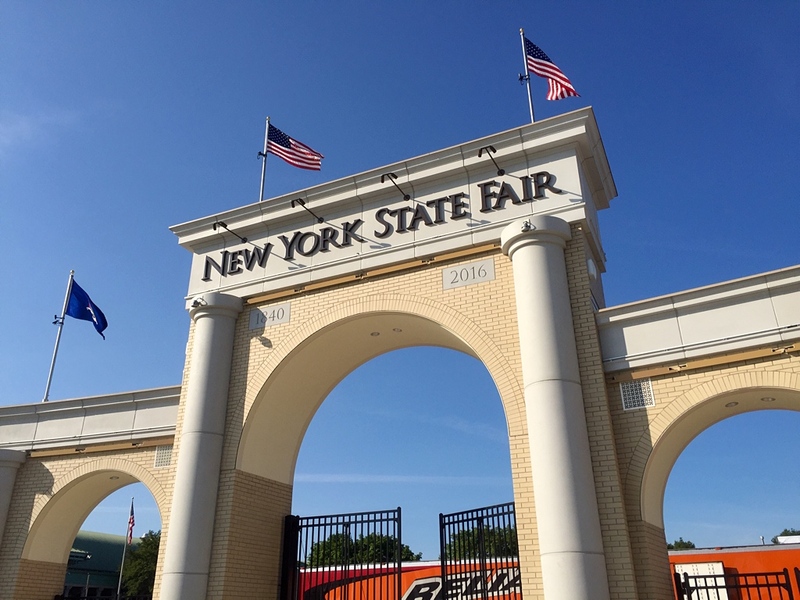 Things will be different when the New York State Fair opens the gates today. From the close last Labor Day, the sprawling fairgrounds in Geddes received a facelift to the tune of $50 million, the folks right there a couple of miles west of Syracuse city proper who hosted our monthly session for the Social Media Breakfast Syracuse group explained Wednesday morning as they served coffee and goodies in the Empire Room restaurant and then hauled us around the complex in a couple of trams. Our tram passes a train as the train passes our tram. They tore down the very old grandstand, which had hosted concerts during the fair and dirt track auto racing in October. A new amphitheater had been built across the road on the shore of Onondaga Lake to hold the shows already anyway. The dirt racing, well, that’s more complicated. 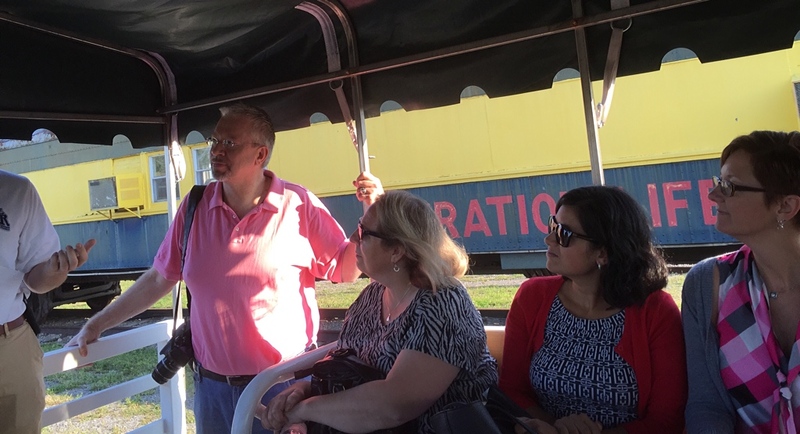 The guided tour showed us the new space for the Midway rides and games. The over-the-ground electric cables are a thing of the past, our guides explained. All the power cords are now safely buried. 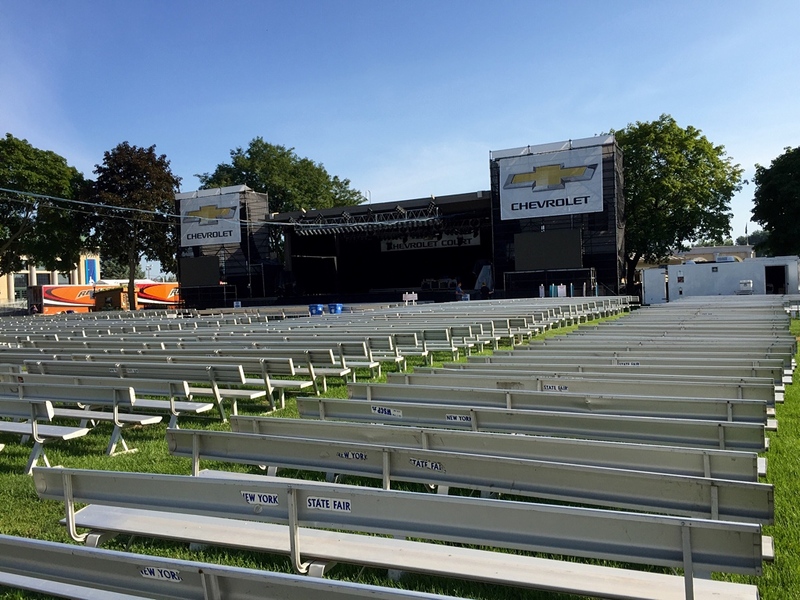 They were always easy to trip over, I recalled on the Tram, when I cut through the Midway from the Press Room to Chevy Court and the Grandstand to review the concerts for the big daily. Basket case on the Midway. The Tram will be free this year, the guide explained, thanks to a new sponsorship by Chevrolet. In the past, the Trams were pulled by tractors. This year, they’ll be pulled by Chevy pick-up trucks. Nice. Our two pick-ups stopped outside the horse barns so we could all pile out for a look. The stalls were all empty. But some riders were walking their gorgeous horses around the fairgrounds. Thankfully. Our last stop was the new main gate. What’s it look like to you? I was reminded of a Roman Coliseum. After taking my photos, I high-tailed it back to my car, passing Chevy Court, where I had to snap off a shot with my iPhone 6. The site of the free shows. My dear wife Karen and I will be going at least once these 10 days, stopping to hear a show. Are you a fan of your state fair? What’s your favorite part of your state fair, and why? Which photo is your favorite, and why? Wait ’til next year, Joey. I hear the weather in Indianapolis is going to be just fabulous. ❤ I'm hoping, anyway. You need some fair food. I’m a huge fan of state fairs. Ours here in Nebraska since forever has been in our state capital of Lincoln. However, a few years back they moved it from the south east part of the state to the central part of the state in Grand Island, Nebraska. The idea behind it was to make it more readily available to the people who participate and encourage the importance. Sure hope you guys enjoy the festivities. The more people who can go, the better, Aud. That’s why Syracuse is lucky enough to host New York’s state fair. We are smack dab in the middle of the state geographically. 🙂 I hope you can make the trip to Nebraska’s once in a while. By the way … Ours here in Nebraska! I truly do have to catch up why you, moving Red. Yeah..me moving. That’s a whole lota beer and explanation, Chum. The long process of divorce and relocating kids to another state was finalized. Home to family we came. Feels good to be home again. As long as it’s a happy place for you, Red. When I worked the fair 12 days straight afternoon and night concerts, I ate a lot of food there, Beth. That was a contest for me, all right. Urp. 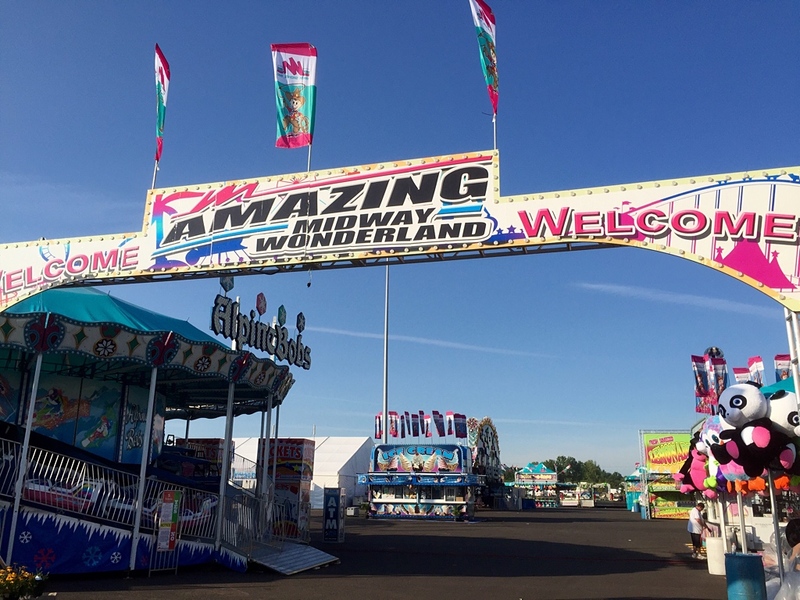 Mark: we got a tour too at the Fair to look at some of the new accessibility features. https://www.facebook.com/CNYADA/photos/?tab=album&album_id=1082445285125003 You got a lot better photos! Love the Fair, we go every year–at least twice. Back in the day I wish they had that 5 day pass they are offering this year. The only bad thing about the Fair? When its over, that’s about it for summer too! Photo ops aren’t always easy, Phil. I hope you enjoy Brian. And I hope he’s up to a big crowd. It’s bound to be packed! You’re right. When the fair is done, so is our summer, my friend. Went yesterday and attended the concert in the Amphitheater. I was surprised at how much space was left open. Especially on the west side of the grounds. They should have tried to fill those places with more things for people to see, do, eat and shop at. How’s this for an idea…move all the vendors in the Center of Progress building to an outside tent/tents and use the CoP building for ideas…you know, progress like stuff. They need to supply more buses for people to get from the fairgrounds to the amphitheater. Had to wait 30 minutes for a ride in front of the Main Gate. It was very confusing and people didn’t know where the ticket line was at times. It should work like an SU game does with a steady stream of buses for the 2 hours needed. Now for the positive…it is much more open and easier to get around. Chevy court is much much better. Just have to get used to the new locations for vendors. I’ll be back this weekend. I only hope the new app will show starting times on time instead of 90 minutes behind as it did yesterday. I”m sure bugs have to be worked out still, Scott. We’ll find out when we go with the crowds, I see. Thanks for pitching in with your observations! Very nice Mark – that’s a lot of dough to put into a fair site. they must use it for other things when the fair is not on, do they? They use the buildings for expos and weekend events year-round, Paul, and the amphitheater for concerts June thorough September.